BLODCRIMINAL PROMOTION SERVICES is a promotion agency particulary addressed to emerging bands who feel the need to spread their music the extreme music business world and to other related activities that intend to become well known with their activity in the musical field. 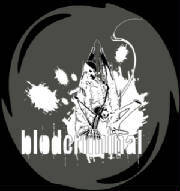 BLODCRIMINAL PROMOTION SERVICES only support the band that into extreme metal music. The reason of the existing of this project is only to bring up the hidden-talented band to be well known to the other parties especially to try to bring our so-called Asian's good talented band been known to the other territory but it goes the same to the other region band and others related activities, our main purposes is to get everybody know the existing of your/their named within our own territory. For sure we at BLODCRIMINAL PROMOTION SERVICES totally support to any kind of EXTREME METAL (e.g:doom, black, death, etc) plus selecting Grindcore music and just please take note, others than that please go away!!!. If you thing this might help you a lot in term of promotion, don't hesitated to email us to get more detail about it. What We Need To Run The Campaign..
and we will do the rest!! So if you think by doing a promotion regularly in this website we give you a good exposure and respond, what you are waiting for just send me a possible complete promotional press kit for our own observation and we’ll do the rest.Meanwhile just check all band listed below for further information. Label/Magazine/Radiostation/Webzine - We in progressing to keep an update a new contact data base.So if you interesting to work out something with us please send us your most current profil. + Do you dare to run your promotion campaign in here! !